BERNICE EN YUEN LIU TAWARAHARA Passed away on September 12, 2018 at the age of 91. Born in Honolulu on July 18th 1927, she believed that "every day is a good day" and that we should "live life to its fullest each day". A devout Episcopalian, she attended weekly service at St. Mary's church in Mo`ili`ili from childhood till her passing. She lived a life full of service to the church. 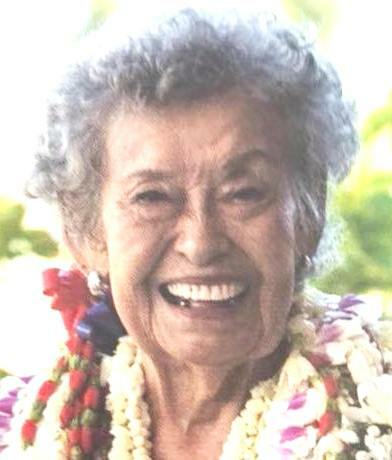 She served on the vestry, chaired the Centennial Celebration, did numerous outreach ministries, chaired the alter guild and aloha hour, attended countless conventions as a delegate and participated in ECW. We are grateful for Fr. Greg and the support of the congregation at St. Mary's. Although a graduate from Kaimuki, Berdie loved her `Iolani Raiders. Two sons and two grandchildren attended the school and she enjoyed watching the various sports with her other "Raider ladies". Aside from being `Iolani's number one fan, she is most known on campus for her jams, jellies, pickled mango, and the ever-popular mango chutney, which she continued to make until a few years ago. She missed going to the games, but often reminisced on championships won and her favorites athletes. Bernice is predeceased by husband, Charles Yoshio and sons Mark Charles and Peter Yoshio Tawarahara. She is survived by son, James; daughter, Ruth; daughter-in-law, Abigail; grandchildren, Daniel, Joey, Ashlee, and Dara. She is also survived by sister Amy; grand nieces and nephews that brought so much joy to her life, Kili, Ahe, Kaili, Makau, and Marcus. Berdie's Celebration of Life will be held on Sunday, October 21, 2018 at St. Alban's Chapel, 'Iolani School. Visitation with the family will begin at 10AM with the service to follow at 11AM. Following the Celebration, a gathering will be held in the Student Center."